No hint of Phase 2, Site 5, or future Gehry role; also, has promised open space been cut from eight acres to six? 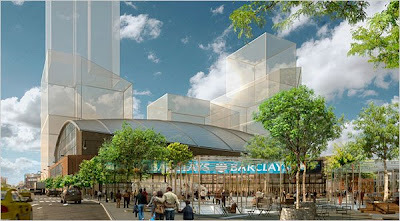 Forest City Ratner Companies (FCRC) and Gehry Partners today announced a mutual agreement in which Pritzker Prize winning architect Frank Gehry, who produced the master plan for the Atlantic Yards development in Brooklyn, will no longer serve as the architect for the arena to be called the Barclays Center. As the master planner for the Atlantic Yards development, Frank Gehry created a blueprint for what will be a vibrant new urban community blending an arena, housing, retail and commercial space, as well as six acres of landscaped public open space. Past tense = no more Gehry? Note the use of the past tense, which suggests that Gehry may not have any continued role in Atlantic Yards. Why ask him to design a tower that wraps around an arena when the arena has changed so dramatically? It would be much less costly to get another architect. As with the May 2008 release of new designs for the Atlantic Yards arena block, the latest renderings show nothing of the 11 towers in Phase 2, nor the tower at Site 5, which is currently occupied by P.C. Richard and Modell's. Perhaps new renderings will be released later this month, as the developer has promised. But they will be little more than placeholders, given that there's no timetable to construct Phase 2, according to the State Funding Agreement, which gives 12 years to build Phase 1. Six acres of open space? Maybe the person (newbie?) writing the press release last week was looking at 2003 press materials for Atlantic Yards, when Forest City Ratner promised six acres of open space. Or maybe the eight acres promised on 12/8/06 project approval--see ESDC press release--has been cut by 25%. Given that all the permanent open space--as opposed to the apparent temporary open space in the rendering above--is supposed to be built in Phase 2, the number is effectively zero for now.